2012 Atlanta Chef's Expo - tickets available now! Last time we were in Charlotte I dined with my parents at Vietnam Grille. We usually go to Saigon Palace, which is only a few blocks away, but this time we wanted to try something new. Vietnam Grille is fairly small and homey and is obviously family owned. It would be difficult to accommodate a very large group here but it is a nice and cozy place for a couple or family. The menu is ranges from soups, noodles and rice dishes to traditional Vietnamese dishes and beverages. We tried the pictured house special vermicelli, which was very good - lots of picked carrots and radishes and tasty meat - as well as the seafood noodle soup (not pictured). The soup didn't stand out as much as the vermicelli, but the fresh spring rolls were very good - one of my favorite foods! I don't think Vietnam Grille has the yellow pancake (banh xeo) we like so much on the menu. For that (and for large groups) I will keep going to Saigon Palace - or back to Vietnam - I hope to finally put some food photos from my SE Asia trip up soon! If you are in Charlotte Vietnam Grille is a solid choice for reasonably priced tasty food. I look forward to trying additional menu items on future visits. Wagyu cheeseburger with fried egg and crisp onions with side of roasted root vegetables. I was invited to come try Capital Grille's new addition to the lunch plates menu: Wagyu cheeseburger, roasted root vegetables and roasted pepper soup. The plates menu allows customers to choose a soup/salad, main dish and side for $16 at lunchtime. Other selections include the lobster roll (below) and mini-tenderloin sandwiches as well as clam chowder and truffle fries. The new burger is delicious - the fried egg and onions adding extra flavor to the already rich Wagyu beef. The term "Wagyu" means Japanese cow and refers to several breeds of cattle (including Kobe) whose meat is genetically predisposed to better than average marbling, leading to tastier, more tender, juicier meat. This is definitely my top pick from the plates menu. The roasted root vegetables are also tasty, basted in olive oil with rosemary peeking through. The roasted pepper soup is another winner - skip the salad and try this soup instead - it has a nice bold flavor. As always the service at the Capital Grille was delightful and the upscale atmosphere including the stellar views of Atlanta can't be beat for a special occasion or business meeting. Roasted Pepper Soup and mixed greens. Lobster roll with French green beans. Good amount of lobster meat but not served warm like in New England! Trio of ice creams with cookies. I always love ice cream, especially when it's homemade. The cookies were chewy and tasty - a treat to end the meal. Yogurt and toppings - quite a nice variety! I was recently provided with a gift card in order to sample Yogurtland, a self-serve frozen yogurt shop (apparently the first such company that offered self-service) with 170 locations in the US, Guam and Mexico. The majority of locations are in the western half of the US. In Atlanta there are 2 locations, one on West Paces Ferry Rd. near I-75 and another in Norcross. A third location in Peachtree City is coming soon. At the West Paces Ferry location on a recent rainy Saturday, high school kids dominated the constant crowd in the bright, friendly shop. A sprinkling of young families played into the mix as well. Although I believe the Atlanta yogurt market is over-saturated I was pleasantly surprised with Yogurtland's flavors, toppings, atmosphere and price. I tried many of the available flavors (more than a dozen!) including limited edition Yo Frappe and Mango Mixer tart flavors. Both were tasty. I personally prefer the tart flavors, and found the plain tart flavor to be delicious, especially when coupled with fruit and chocolate toppings! Toppings include the usual fruits, nuts and candies as well as mochi and tiny pieces of cheesecake as well as cookie dough bites - definitely appealing for the under fifteen set. Other flavors I enjoyed include Pecans & Pralines, Superfruit tart, Guava-Pineapple tart and Red Velvet Cupcake Batter. In my experience it is hard to find a good chocolate frozen yogurt and Yogurtland's version was pretty good - another welcome surprise. On the company's website you can view all flavors. I would love to try the Matcha Green Tea (which was not available when I visited). I was also impressed by the pricing. At 33 cents per ounce the cost is reasonable and seems quite a bit lower than some of the other local yogurt establishments. Each of the above creations cost about $3.50. If Yogurtland was closer to me it would definitely be my top pick. Give it a try and let me know what you think! Disclosure: The yogurt described in this review was complimentary. Truffle Burger with fried zucchini and the Classic Burger with sweet potato fries. I sampled Morningside's new Burger Tap soon after its soft opening. You order at the counter, where several beer taps are also available. The look is industrial, with metal tables and clean lines, which may be a bit too "trendy" for maximizing business in this location. I hope they decide to install padding on the benches and add some individual tables to the large space in front. I enjoyed the food, especially the truffle burger with gruyere, fried onions, garlic mayo and a truffle glaze and the fried zucchini. The burgers are served in a unique shape (rectangular) which seems to cause some people to feel that they are too small. I think the size is fine so long as you are up for one of the side dishes. If not, you may want to order 2 burgers. The sweet potato fries are made using Korean white sweet potatoes - a different taste and feel from the usual but good. I'd like to see a wider variety of non-alcoholic beverages as well as more desserts - they have ice cream which can be made into a float. It would also be nice to have a more kid-friendly space. I learned that since my visit they have added a price-sensitive kids meal which is a great idea. Friday, January 20th from 6 - 11 p.m. Burger Tap will offer $.25 (twenty-five cent) pints of Bud Light, Newcastle or PBR when you purchase a burger. 50% off all other beer selections. Saturday, January 21st from 12 noon - 7 p.m. Burger Tap will treat children 12 and under to a complimentary Kid's Meal, which includes a hamburger or cheeseburger, side of fries and a juice box. Check out Burger Tap for yourself and let me know what you think! Dining area - there is outdoor seating also. Southwestern Burger with fried jalepeno. View of the kitchen and condiment station. I was recently invited to come in and try three new flavors of guacamole at Uncle Julio's. The pineapple bacon guacamole pictured above was my favorite of the innovative new varieties. It has an intense flavor with the smoky bacon playing nicely with the fruit. The other two: roasted corn and lump crab guacamole and spicy three pepper with diced jalepeno, habenero and red bell peppers were fun to try as well. The spicy three pepper is actually really spicy - I was impressed they did not hold back! But that pineapple bacon - definitely the one I recommend most! As a bonus we were offered sopapillas - hot, sweet and tasty. Disclosure: The meal reviewed in this post was complimentary. Atlantans can now purchase tickets for the inaugural Atlanta Chef’s Expo, the city’s ultimate taste test event set to take place Sunday, February 19, 2012, at the Foundry at Puritan Mill. This inaugural culinary event will include menu tastings from local chefs, cooking demonstrations and more, benefitting Susan G. Komen for the Cure of Greater Atlanta. 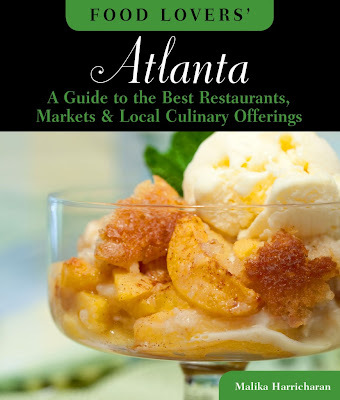 The highly-anticipated epicurean expo will highlight Atlanta’s greatest in restaurant dining and catering opportunities including tastings from restaurants such as Thrive and Marlow’s Tavern; sought-after caterers including reMARKable Meals and Wolfgang Puck Catering; and sweet treats from local pastry chefs including Dr. Sweet’s Cake Emporium. To help Atlanta foodies navigate through the plethora of tastings, the expo will be broken into categories including “Restaurant Row,” “Catering Alley,” The Sugar Shack” and “The Chef’s Table.” Popular blogger Broderick Smylie, known as Savory Exposure, will judge each category and select a “Most Creative” while guests can choose their “Fan Favorite.” Additional judges for the event include Holly Firfer from Star 94 and Atlanta on-air personality Tom Sullivan. Between tastings guests can enjoy cooking demonstrations from beloved local chefs throughout the day. Featured guest chefs include chef Ginny McCormack, an expert in Southern hospitality; one of the most sought after private chefs in the country, chef Dwayne L. Hairston; one-time “Chopped” winner and co-owner of The Hungry Peach, chef Suzanne Vizethan; and pastry chef Juanita Threlkeld who designs weddings cakes. Guests can also enjoy cocktails from presenting sponsor ABSOLUT Vodka, along with musical entertainment from Joel Rabe of Lethal Rhythms. Tickets are now on sale. General admission tickets are $25 and VIP tickets are available for $50. The expo is also seeking sponsors for the event in support of Susan G. Komen. Packages range from $500 Silver Sponsors to $2,000 Platinum Sponsors. For more information or to purchase tickets, please visit www.atlantachefsexpo.com. Enjoy with ABSOLUT RESPONSIBILITY®. ©2011 Imported by Absolut Spirits Co., New York, NY. Valid ID required 21+ to be served alcohol at the Atlanta Chef’s Expo. From top: the Eastbound & Down (with pulled pork), the Classic dog and the Jerk Chicken. I recently succumbed to the hype and tried HD1, Richard Blais' "haute doggery" of recent fame. Not being a huge hot dog fan, I enjoyed it more than I expected, especially the Merguez (lamb sausage with currants, minted cucumber relish and yogurt) and the Jerk Chicken (chicken sausage with mango pork ragout, curry ketchup and ginger crunch). The fries were also tasty as was the peanut butter soft serve ice cream (not pictured). The space here is trendy, as one would expect from a Blais establishment, although it is not as hypertrendy as Flip. The service was a bit slow. There are communal tables, a bar and high-stool tables (where we sat), none of which make for a very comfy situation. The better to get 'em in and get 'em out, most likely. Overall I suggest giving it a try - definitely a unique concept in Atlanta. Waffled fries with "maple-oy", the Merguez (lamb dog) and the beet salad. The Sherlock Holmes Roll - not sure why it is called this but I love this spicy tuna roll topped with more fish and a tiny piece of lemon. Tangy, spicy and delicious! Recently we dined at Thaicoon in Marietta just before viewing a performance of "The Sound of Music" on Marietta's historic square. This restaurant has a sister located near where I live at the Sage Hill shopping center on Briarcliff Road. For no particular reason, I have not actually had a meal there although I've ordered take out several times. This was a great opportunity to sample the offerings, which are similar at both restaurants. My favorite dishes here include the above fancy sushi roll and the basil duck. The tom yum kung soup was also good. The Panang curry with scallops was too bland for me - one of those instances when the spice stars don't mean a thing - definitely a disappointment after our recent trip to Thailand! Thaicoon was crowded - it was Saturday night - so make a reservation if you're going at a popular time. If you have never tried Thai food this is a great place to start. There is a full Japanese menu available as well including several other creative sushi rolls like the Caribbean Roll, which includes snow crab and shrimp tempura. Panang Curry with Scallops - not enough spice for me! Tom Yum Gung - good flavor but not heavily spiced. Kimchi Rice - a deliciously flavored perfect comfort food. Love it! I recently dined with fellow foodies at Miso Izakaya, a place I've blogged about before. Read about my first visit in 2009 and my awesome tasting visit in 2010. Miso has consistently improved since its opening and I found my latest visit exceptional as well. The above kimchi rice is not complicated but the flavors meld together perfectly with just enough spice - definitely a must try this winter. The fried Camembert is also a winner (although I don't want to think about the calorie content!) - do what I did and share with a friend. The sushi is also drastically improved since opening. The white tuna was particularly delicious. Fried Camembert. Need I say more?! The sushi was also excellent. Spicy tuna handroll, white tuna and salmon sashimi.